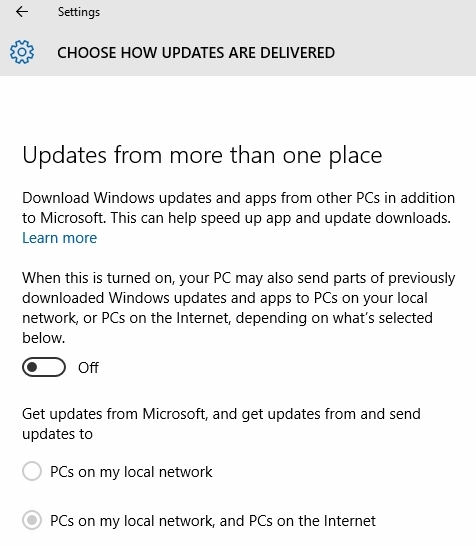 As you can see, the default is On for downloading Windows updates and apps from other computers, and for using your computer to send Windows updates and apps to other computers — and there's an option for those other computers to be only on your local network or, believe it or not, on the Internet! This also confirms what I observed above, namely, that the so-called Delivery Optimization setting defaults to On — and for all editions of W10! 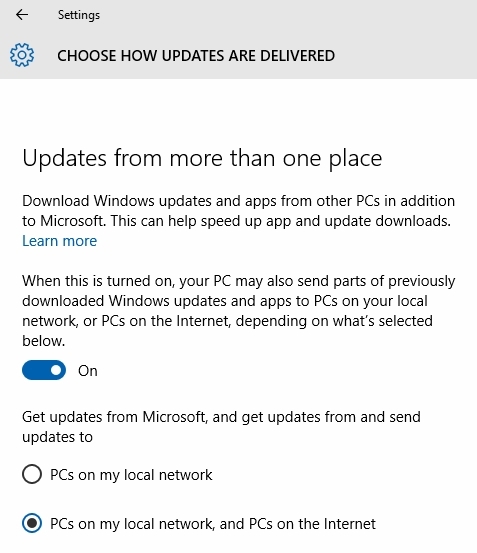 There is, however, one important difference in the various W10 editions, i.e., Enterprise and Education have only the local network option on by default, while all other W10 editions have your local network and PCs on the Internet on by default. Or you may leave it on, but tick the PCs on my local network radio button rather than the PCs on my local network, and PCs on the Internet radio button. I'm not going to weigh in on the merits of this feature. Since learning about it, I've read many opinions on the web, and perhaps this article will spur a lively discussion here at EE. Some folks are worried about getting malware on their PCs from this feature, other folks say that it is not possible to do so. Some folks like the idea that they are not totally dependent on the (possibly slow and bogged down) Microsoft servers for updates and apps, while others say that it is not worth the hit to their own network bandwidth. Interesting food for thought.